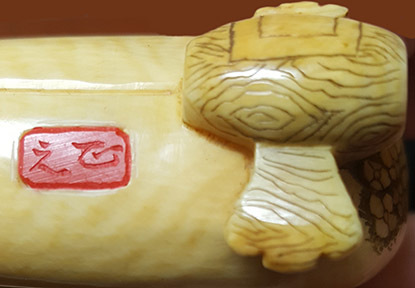 Subject:Ivory Carving Men in a Boat? Hello...I'm wondering if anyone can help identify the motif of the ivory carving...gods? Folklore? Simple fishermen (though one appears to be a scholar)? Also, any clues regarding the period and the signature? I believe Japanese and judging by the ivory composition, elephant. Thanks very much for your assistance. Subject:Re: Ivory Carving Men in a Boat?